NIST traceable calibration of the U6-Pro (and all U6 variants), T7-Pro (and all T7 variants), or UE9-Pro. Industry standard calibration interval is once per year. Includes a calibration certificate. A certificate is needed. Due to the nature of our production process, it is not cost effective to generate a certificate for the original factory calibration, so one is not included with a normal purchase. Recalibration is needed. 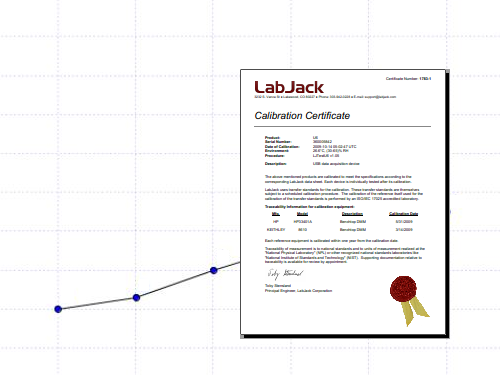 Many organizations or processes that require a calibration certificate also require that devices be recalibrated or verified at some interval. 1 year is the industry standard interval. A "fresh" calibration is desired. Since we try to keep substantial stock on hand to provide immediate shipment of all orders, it is possible that the factory calibration could happen some months before a device ships. 1. Purchase the desired quantity and note the order number. 2. Ship the device (only the device itself ... no cables, power supply, etc.) to LabJack at the address shown anywhere on our site. Reference the calibration service order number from step #1. 3. Typical lead time at our facility is about 1 week once we receive your device. The calibration process can be expedited on request to meet demanding schedules. You only need to check one channel as they are all multiplexed to the same AIN circuitry. You do want to check both converters on a -Pro, so ResIndex 8 and 9 on a U6-Pro or T7-Pro. This should be done with the device stabilized at room temperature. To avoid confusion, this should be done with no other connections except comm/power. Accuracy of the excitation voltage (output is proportional to excitation). Accuracy specification of the strain gauge. Accuracy of the bridge completion resistors. Accuracy of the math relating strain to voltage. Errors due to resistance of connections and wires. Errors due to mounting of the strain gauge. Accuracy of the LabJack A/D conversion. Say this strain gauge measurement is to measure force applied to a beam. A great way to handle this is to apply 2 known forces (0 pounds is one easy force to use), note the 2 associated digitized voltages, and then come up with a slope & offset that relate volts to force and apply this in software. Thanks for your quick and most excellent response and solution. I just started using the U3-LV and DAQFactory and really like them both.